Adding Social Media sharing	& Facebook Like	buttons	to	your page is a great way to exponentially multiply	the	number of people exposed to	your cause. 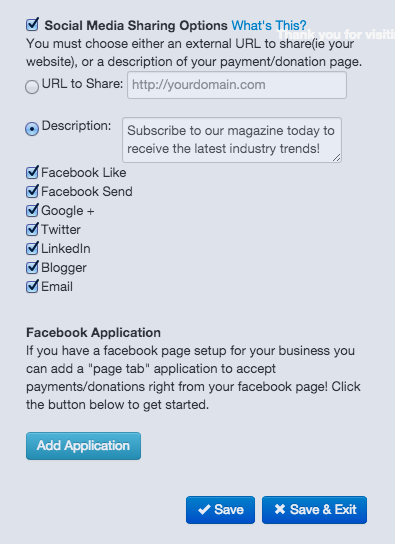 Choose from the major Social Media sites by selecting the checkbox for each one. 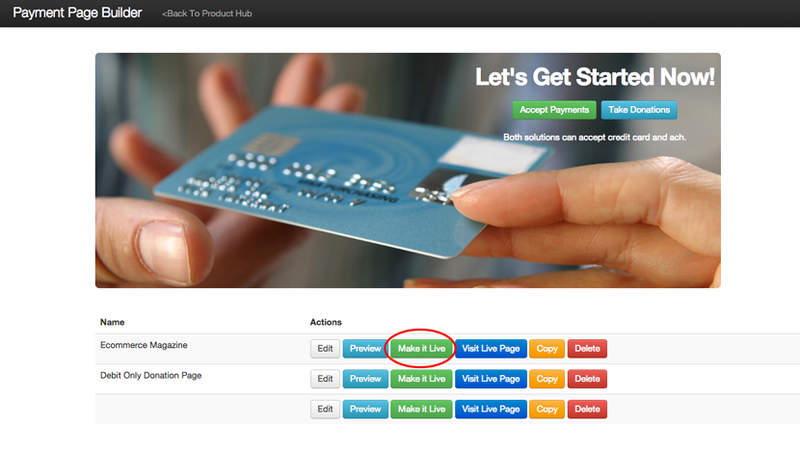 When editing your page with the Payment Page Builder, navigate to the Design tab. Provide a custom URL to share: This option provides the flexibility to point traffic to any website, or Facebook page rather than to the donation/payment page. Fill in the entire URL, such as [http://www.yourdomain.com]. When using this option, keep in mind that Facebook will inspect your specified website page and determine the best manner in which to represent it by arbitrarily selecting an image and description. To control the Facebook selection process it's necessary to add Facebook Open Graph support to your website. See this link to learn how to control the image and description utilized by Facebook. Enter a description: This option is useful for when you do not wish to share an external URL, and would like to give a description about your payment page. Choose this option if you wish to point the traffic to the donation/payment page. 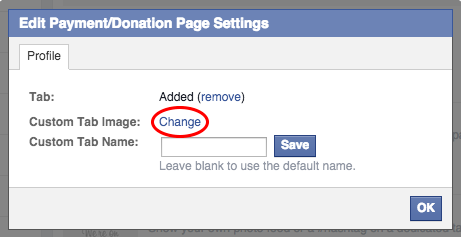 Users who click on their friends' Newsfeed links or posts will be able to click directly to your donation/payment page. The description should be concise and explain the donation/payment page purpose and cause. 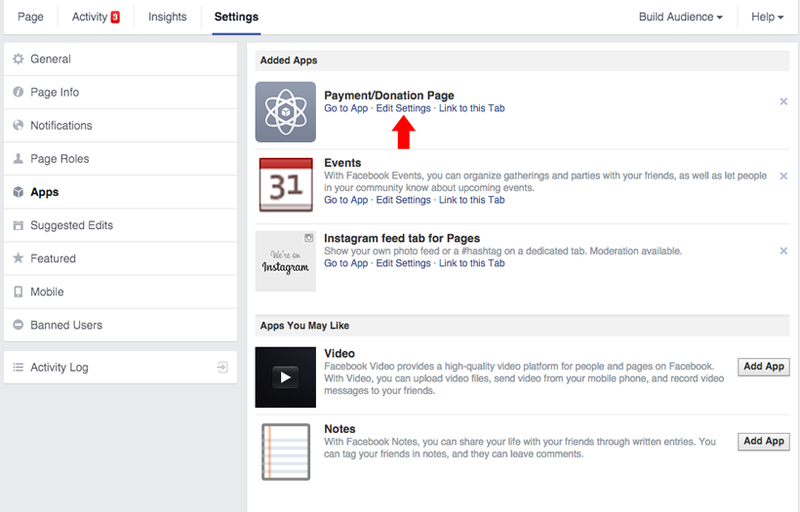 Facebook Like: Allow users to like your payment page on their Facebook page. Facebook Send: Allow users to share this page on their Facebook wall and Newsfeed. Google+: Allow users to share this page on their Google+ profile and Newsfeed. Twitter: Allow users to tweet and share a link to your page. LinkedIn: Allow users to share this page in their LinkedIn Newsfeed. Blogger: Allow users to share a link to your page in their Blogger blog. Email: Allow users to email a link to your page. Click the blue Add Application button. You will be prompted to log into your Facebook. Enter your login credentials and click Log In. If already logged in, continue to the next step. In the left-hand navigation, click Apps. Click Edit Settings under the Payment/Donation Page. Next to custom tab image, click Change. Click Browse to search for the image to be used. The file can be a JPG, GIF or PNG. If the image is larger than 111x74 pixels, it must be resized and converted. The file size must be 5MB or under. 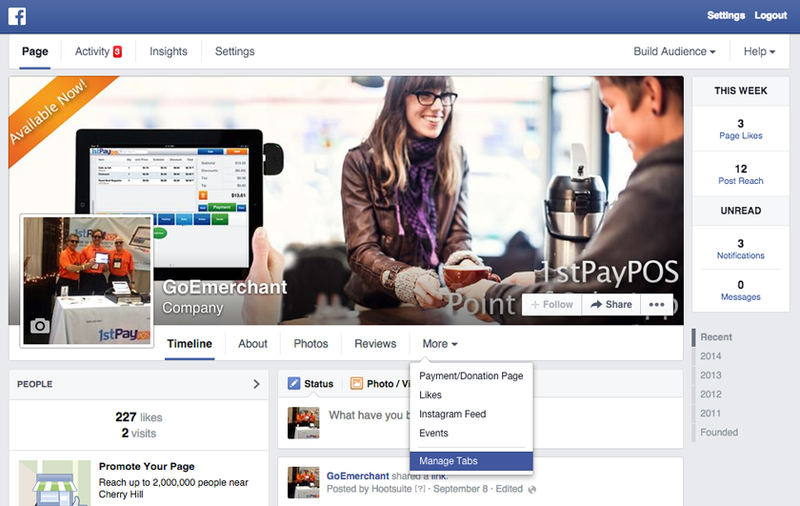 Select the image you'd like to use for the Payment Page Tab on your Facebook page. 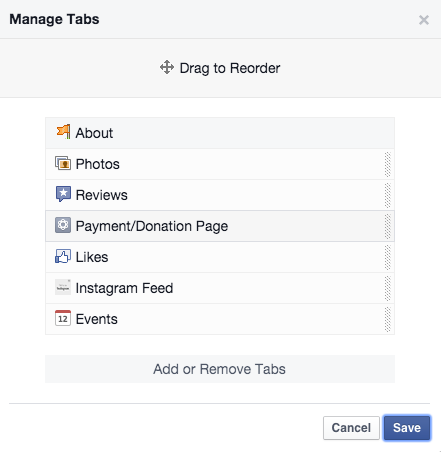 In the top menu on your Facebook page, click More, and select Manage Tabs. A window will appear that allows you to drag the order of tabs. Click your Payment/Donation Page App, and drag it to the position you'd like. For more assistance with Facebook, please visit this page.